The best price is guaranteed on our web site only, contact us or use our booking-online. Comfortable double room with bathroom, shower , hair dryer telephone, internet wireless connection, sat TV, in-room safe. Stylish room with bathroom, tub/shower , hair dryer, internet wireless connection, telephone, sat TV, in-room safe. 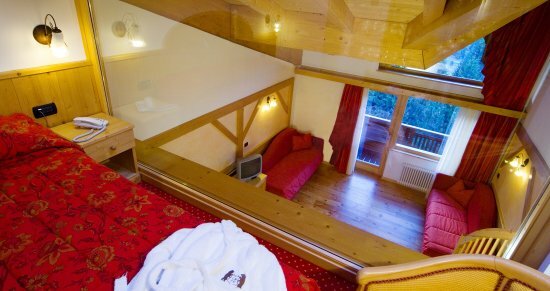 Luxurious suite on two levels with large living room, two bathrooms, one with tub and toilet separated, the other with shower, hair dryer, telephone, sat TV, internet wireless connection, in-room safe, balcony with view of the Dolomites. Lussuosa Suite con due con due camere da letto, un ampio soggiorno e due bagni: con doccia, vasca, asciugacapelli, telefono, TV satellitare, connessione internet ADSL, frigobar, balcone con vista sulle Dolomiti. The prices are per person per day with half board plan. For the Classic Dolomites and Superior rooms, dinner is in the grand buffet restaurant, while for the Junior Suite and Baita Suite, dinner is in the restaurant with waiter service. For stays for babies from 0 to under 2 years: € 50,- per day from 27th December to 06th January, € 30 in the other periods. Overnight free with meals consumed in all other periods of the year. 2nd, 3rd, 4th, and 5th bed for children under 8: -30%. 3rd, 4th and 5th bed for children from 8 to under 12 years: -20%. 3rd, 4th and 5th bed for adults: -10%. Special discount of 10% on wellness treatments in the morning. Full board: € 25,- per person per day. Waiter table service: € 5,- per person per day for Classic, Dolomites and Superior rooms. New Year’s Eve Gala with orchestra: € 100,- per person (beverages excluded). On treatments / wellness packages a supplement of 10% for appointments from 4:00 -7:00 PM. On the day of arrival rooms are available from 2:30 PM, on departure check-out time is 10:00 AM. Gala dinner for Christmas: included. The classic dinner of 31st December is served from 7:00 PM to 8:00 PM. Meals not consumed are not refundable. The entrance to the pool for adults and children is from the age of 12. Access to the children’s pool is free. For pool access rubber slippers and bathing cap is required (also sold in our centre). In the wellness centre you will find soft robes and towels for your use.